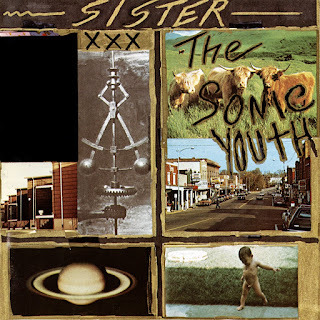 The blunt, chaotic sound of Sonic Youth's visionary but difficult early work had begun to give way to a more coherent and song-oriented attack on 1986's EVOL, and with 1987's Sister, Sonic Youth revealed that they were a great rock band as well as a great art band. From the shifting dynamics and disquieting mood of the opening track "Schizophrenia" to the ferocious coda of "White Cross," Sister was the work of a band that had grown impressively stronger and more unified in the 12 months since their previous long-player. The sheets of sound that issued from Thurston Moore and Lee Renaldo's re-tuned and modified guitars were still the core of their sound, but Sonic Youth's songcraft was steadily improving as they made better and more effective use of their aural palette and created a melodic context that helped their noisy report make greater dramatic sense. After going through a handful of drummers, Steve Shelley finally gave Sonic Youth the combination of chops, imagination, and force that they needed behind the kit, and while he certainly improved EVOL (his debut with the group), it was Sister where he truly make his mark: the steady pulse and rhythmic shadings of "Catholic Block," "Stereo Sanctity," and "Tuff Gnarl" helped firm up the tunes and added some discipline to Moore and Renaldo's exploratory guitar work that, remarkably, made their twisted instrumental figures more impressive and no less distinctive. And the warmth and clarity of Bill Titus' all-analog engineering made the guitars (and Kim Gordon's bass) sound as glorious as they always deserved; while Sonic Youth had been a band with great ideas from the start, Sister was where the execution finally caught up with the concept, and it was their first truly great album.